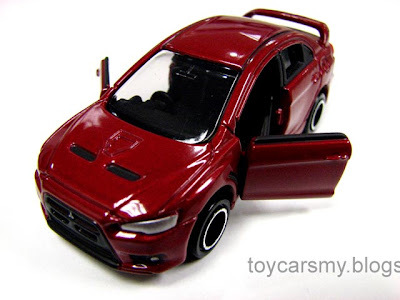 Tomica Honda Civic Type R, how much does it worth? My friend sold his Tomica Honda Type R at RM45.00 yesterday. The ROI he generated from this model is 470%. The highest asking price in Ebay is USD9.99 + shipping USD11.00, or equivalent to RM70.00 in total. He sold at RM45.00 seem reasonable to the market acceptance. If you plan to do the same, you will not able to get it anymore at present market. Confirmation from Malaysia Tomica sole distributor, the model already finished distributed few months back, nothing left in warehouse. How bout i exchange with you? 2 civic type r with 2 hummer H2? Swap swap, what other you want? Got my CTR when I was on holiday in Japan and brought it here in my bag:P Btw, have not seen a single CTR in M'sia since I got mine in Dec. The reason it is rare: The only Honda Civic mold, Type-R and rare. True, the CTR was out for a week and when finished after that. Till date, no sign it will restock. Great to have the Honda Showroom that you recommended. Now it is sitting in my home display cupboard with my Evo X, NSX-R etc and waiting for my incoming Civic Type R from overseas after letting go my earlier Type R.
So any more Type R for sale/swap ? When I got my CTR at the LitTak shop at Sg Wang, there were plenty there! Didn't know they will be snapped up so quickly. I bought 1 for display 1 for open. But the new Lancer Evo is appearing everywhere now! No point bidding on ebay!